There is a bit of a learning curve when switching from a traditional DSLR to this new camera – – – Nikon has eliminated the built-in flash and we had to hunt around for a few of the controls that used to be easily accessible on the mode dial (presets for different types of shots, continuous shooting, etc.). The first thing we did was enable silent mode, We shoot a lot of concerts, festivals, etc. and this allowed us to click away without annoying everyone around us. As a big fan of so-called “continuous shooting” that enables us to take multiple shots in quick succession, we were a bit annoyed when we noticed that the mode dial setting enabling us to take three or six shots per second was GONE! This sent us on a frenzied quest to find out where the folks at Nikon had hidden it (we even resorted to looking it up in the camera’s manual). Silly us! We found the little devil on the lower left side of the back of the camera body, aptly renamed as a release mode self timer button. A simple press of this button allowed us to set continuous shooting at speeds up to 12 frames per second, doubling the speeds we were using on our Nikon D7200. Since there’s no built-in flash we were anxious to see how it operated in available or low-light conditions. The results were as good – – – or better – – – than what we were used to using our old rig, Of course, those of us that are flash addicted can always spend the extra bucks on a Nikon Speedlight, but ours stayed in the camera bag. There’s also a focus assist light that has been available on Nikon cameras. We turned it off, but it can enhance low light shots in some situations. Also new to the Z6 are two programmable function buttons on the front of the camera, which allow you to customize various functions. They default to white balance and focus modes out of the box. Other options can be found in the custom settings menu. Also new to the Z6 is the ability to select a focus point on the camera’s LCD screen by touching it. The lens with automatically focus on that point and take the picture. You can also pinpoint your focus area by using a joystick control on the back of the camera. Also gone are SD memory cards. These have been replaced by XQD high-speed cards. Unfortunately there’s only one memory card slot on the Z6, but there are rumors that an adapter my soon be available. The FTZ lens adapter retails for $249.95, but (as of this writing) is included free when you purchase the Z6 “kit” that includes a Z-Series 24-70 zoom lens. Using older lenses without the adapter can result in damage to the camera. 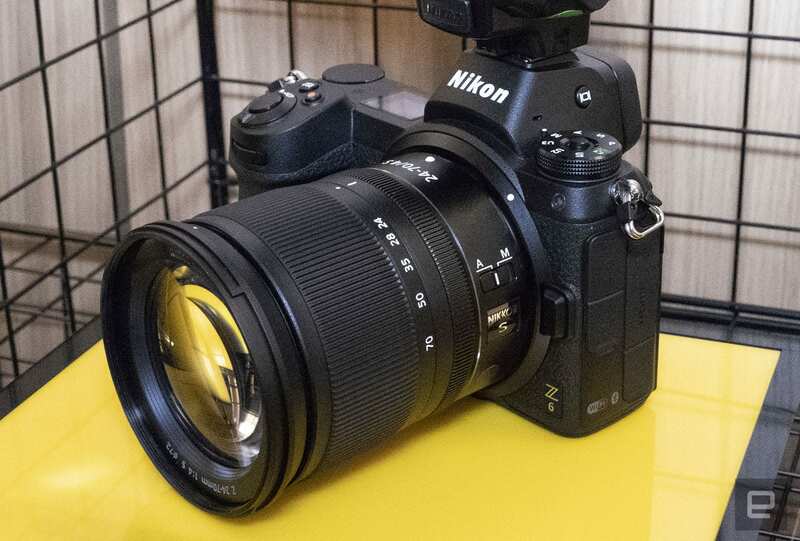 The adapter also adds vibration reduction image stabilization features to older F-mount lenses.